Download a contact list of dentists from across the UK and start marketing to dentists’ offices within minutes. Connect with dentists easily with our accurate, human-verified dentist database, which is full of the direct contact information you need to succeed. This cleansed, purified data will be sure to make you smile! With the help of Bookyourdata.com, you'll be able to find and contact dentists across Great Britain and Northern Ireland. 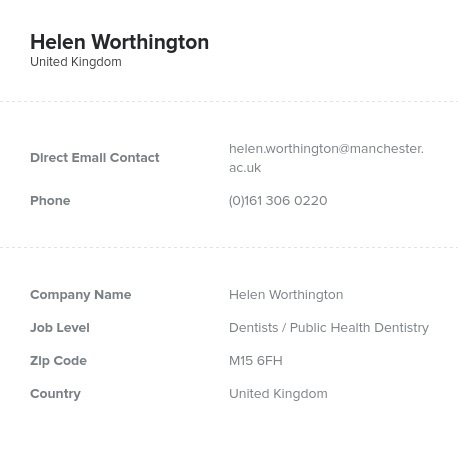 This is one of our ready-to-download, pre-built data products, which is full of the information you need to connect with dentists: emails, postal addresses, phone and fax numbers, and more! With this direct contact information, you can more efficiently market to and network with this targeted audience and build stronger connections. This list can be used in variety of ways. You can create a group or event for dentists in your area. You can market a journal or newsletter. Or you can show dentists in the UK your relevant product, whether that's a brand of floss or toothpaste, medical supplies, dental tools such as mirrors or lights, X-ray equipment, or other oral care products and tools. Share your products with the group most likely to use or recommend them and boost your sales. Bookyourdata.com aims to help medical and pharmaceutical marketers reach out to the people who would be most interested in your product. With this lead list, you can target specifically dentists working in the UK. This pre-built dentist database is ready for you to download now!